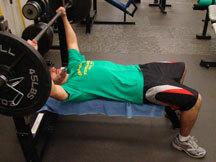 Strengthening exercise for the Pectoralis Major, Anterior Deltoid and Triceps. 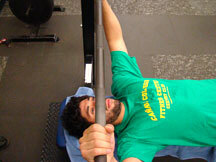 Lie face-up on a flat/horizontal bench. Position body so the racked bar lines up between nose and chin. 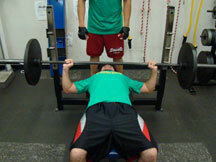 The head, shoulders and hips should stay in contact with the bench throughout the exercise. Maintain neutral spine position. The lower back should retain a natural arch through out the exercise. 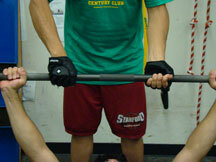 Use an overhand grip with fingers and thumb on opposing sides of the bar. Use the machining on the bar to find the correct hand position so weight is evenly distributed. A normal grip is slightly wider than shoulder width. Align the wrists and elbows on roughly the same plane as the bar. Engage the deep abdominal stabilizing muscles by pulling the navel inward. 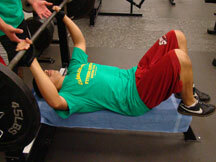 Do not arch back or throw the hips off the bench when lifting. 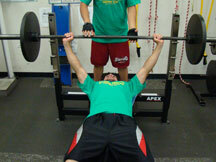 Lower the bar in a slow controlled manner until elbows reach 90˚. The bar should stop at or an inch above the bench. Avoid bouncing the bar off chest. Press bar up by extending arms. Stop short of locking elbows at top of movement. Hold the contraction for a count before slowly lowering weight. Exhale during the concentric muscle contraction, and inhale when lowering weight. Raising feet reduces the chance of over arching the lower back. Always use a spotter when using free weights. Lower weight in a slow controlled manner.